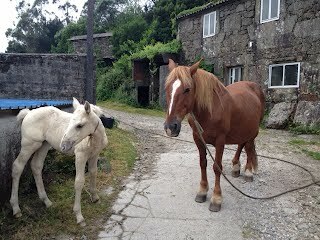 Finally the video of my Camino del Norte in May is ready. It's basically a photo progression of my whole journey from Irun to Santiago de Compostela and then onwards to Muxia and Fisterra. Over 900 km in 36 days. I didn't want to use any commercial music for the video only to have YouTube warn me a week later to take it music out due to copyright infringement. This time, I have something better, my own brother Victor who composes music for a living (thanks bro!). I guess he is constrained by the video which has a picture transition every second, but the final results are fantastic. Together with Dharma from the band The Observatory (where Victor is an ex-member) I now have a great professional soundtrack for this video. 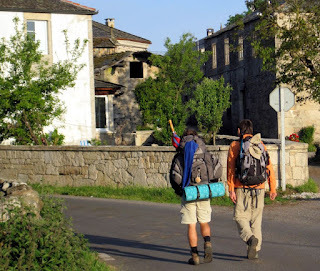 After three Camino de Santiago pilgrimages, this fourth Camino is more like an escape. Just an unadulterated descent to a simple life of walking, sleeping, eating (drinking) and washing (laundry). You can change the quality of this video's playback to HD for better picture quality. I've also upload the same video to Vimeo. A big thanks to Francis for these photos. I believe this was taken after Miraz, a cold morning. We took our jackets off only after about 2 hours of walking. You can see that both backpacks are on 2 opposite ends. Jonathan's backpack is 17 kg, with a 2 person tent, cooker, and that giant umbrella while mine is more of the norm at half that weight. 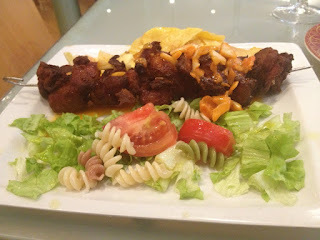 Including photos not posted to this blog. Cheapest way to access the internet on your phone. Available at most Carrefour or Alcampo supermarket, here's more info on Yoigo. When I got mine when I arrived in Spain, the price was 30 Euro including the SIM card plus 800MB per month, enough to check emails, facebook, and upload the photos onto the blog without needing to find a wifi hotspot. I did of course ran out of the data limit it tells me that an additional 300MB I need to pay another 5 Euro. Not an issue as I don't make local calls and have enough balance to deduct for the additional data. With this, I am more relax during this camino as I don't have to hunt down for the library/casa de cultura or bars with wifi. If there are free wifi at the bar that is fine, at least I don't need to search for it this time. The wind noise can't be helped as I don't have any special microphone with me there. What a great way to end the last of walking at Land's end in Fisterra, at sunset, and the sweet voice of Miya playing the guitar. Miya is a musician. You can check out more about her and her music from her website and also her Facebook page. 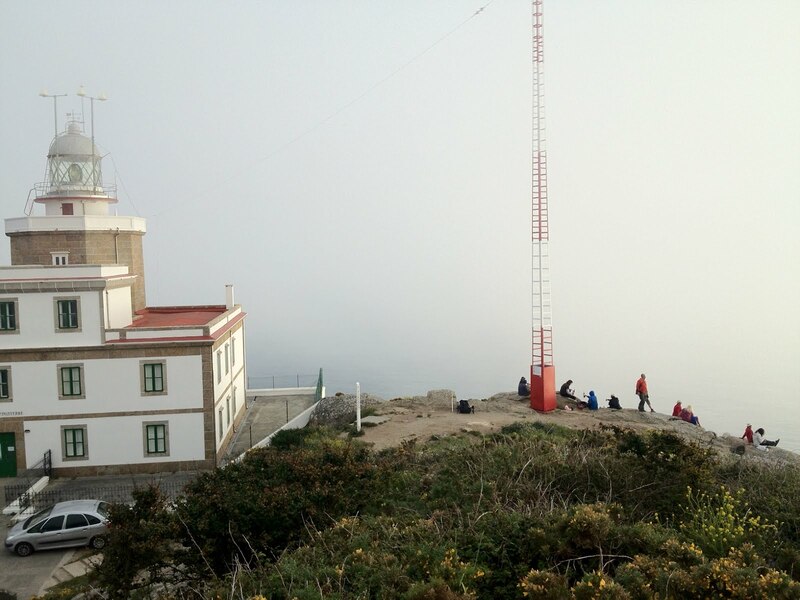 The singer at the lighthouse in Fisterra and her companion John from San Francisco was on the red eye bus from Santiago de Compostela to Madrid with me. They will be here for a couple more days to enjoy the city. Her name Miya Autumn is a pseudonym. She speaks mandarin, spend a year and a half in Beijing. Miya is actually 米雅 (elegant rice). That's it. Unless I bumped into someone else on the flight home. 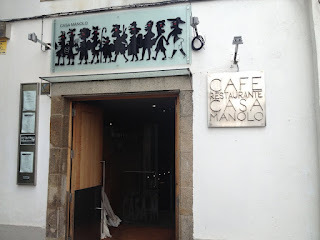 Casa Manolo, probably the most pilgrim friendly restaurant in Santiago. Excellent environment, menu in 4 of the major European languages, excellent food in just the right portion, 2 course meal plus dessert and water (unfortunately no wine this time) for only 9 Euro. The rain has become a drizzle. I've hug goodbye to my old friend Jimmy at the cathedral. Soon it's time to go. The botafumeiro unfortunately was for the mass at noon which missed. Ah well, as least I have seen it before and there is a video of it in the blog. Hope you enjoy the journey with me. Bus leaving 21:30. Done the last minute shopping, basically just pins and chorizo. Left the backpack at the pilgrim office for a euro. The botafumeiro at the Cathedral is hung. Not sure if it was for the noon Mass or for this evening at 7 pm. Will check, maybe I will get lucky this time again and see it swinging. Glad it is already over for me. The weather is looking to be wet the whole day. Also, my bus back to Santiago before noon has gotten into some complications as it is over booked. This is probably also due to the weather and many deciding to just back to Santiago. Another bus came 20 minutes later that is going up to A Coruña and I got onto to that one, which stop half way in a town and I transfer immediately to another bus going to Santiago that has got seats available. If there is a Spanish system, this is probably one of it. Just have to tranquil about it. It will work out in the end. That's it. Another over 3 km walk back from the lighthouse (sans backpack) and my walking is finally done. I am a tourist now, even if it was just for a day or so. Tomorrow a bus back to Santiago for a last look and some shopping before a midnight bus to Madrid for my flight home on Wednesday afternoon. By the time I get back home on Thursday afternoon I will be plastered. On the bright side, I have 3 days to recover. I have walked over 900 km in the last 36 days. 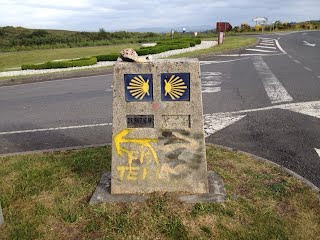 My Camino battery have been recharged, for a while anyway. 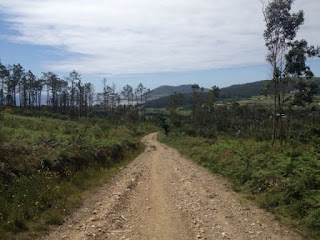 You bet that there is going to be more Caminos as long as I am able to walk. 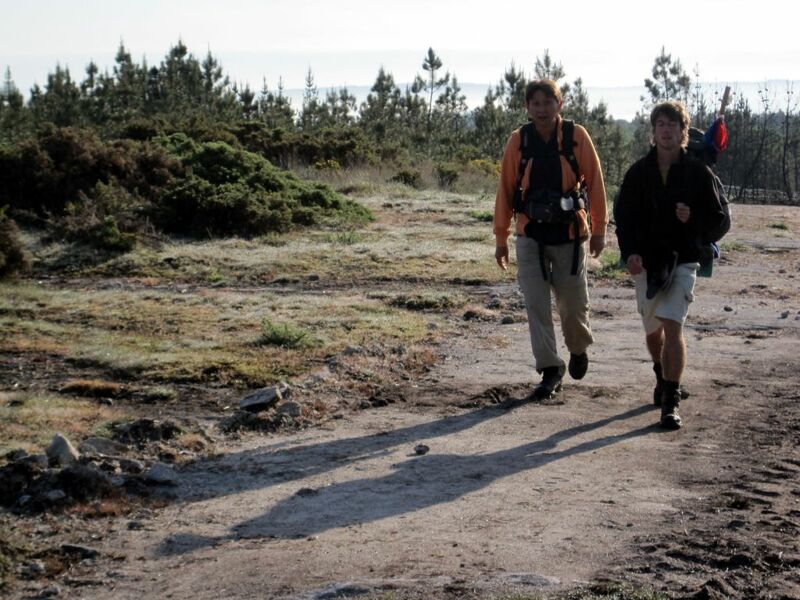 Many people asked me of all the 4 Caminos that I have done, which is my favorite? All the Caminos are different. 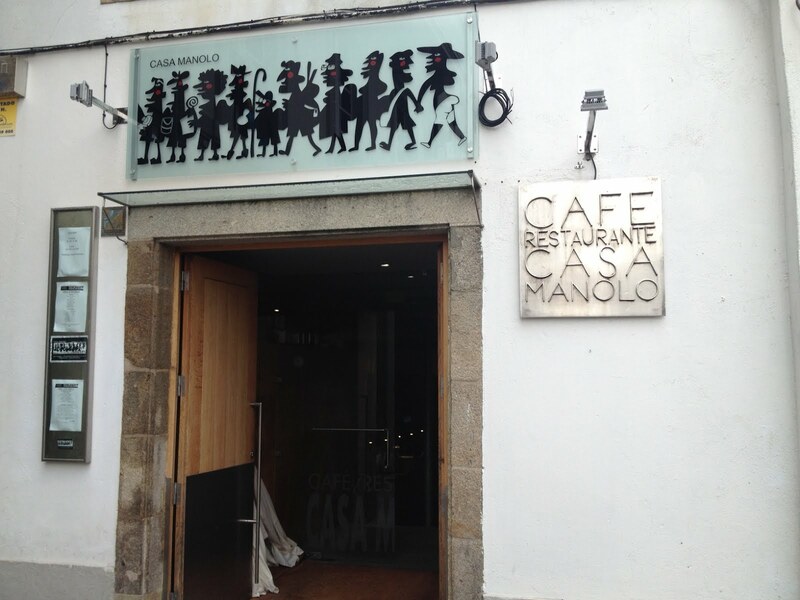 The Camino Frances is cultural and varied, and best for the first time even though it is crowded. The Camino Primitivo is rural and mountainous and lots of time for reflection. 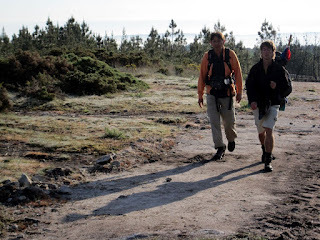 The Camino Via de la Plata is wide, long and flat, and you can really empty your mind. And this Camino del Norte is hard and technical, but with so many places of intense beauty. 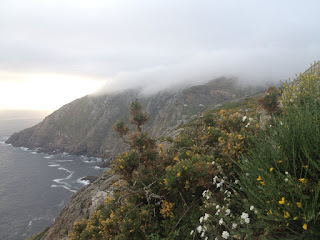 And whichever route one walks, the 3 or 4 days from Santiago to land's end (Fisterra and/or Muxia) is a good way to end the journey. It's past 12 am now. Good night. Miya Autumn from Switzerland singing beautiful songs. At the lighthouse where a crowd is gathering. 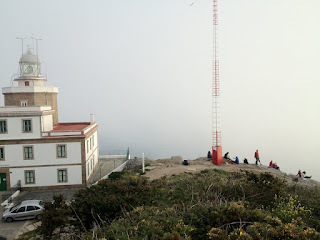 Less than the norm as the weather has become a bit cloudy and some has chosen to see it earlier and skipped the sunset. 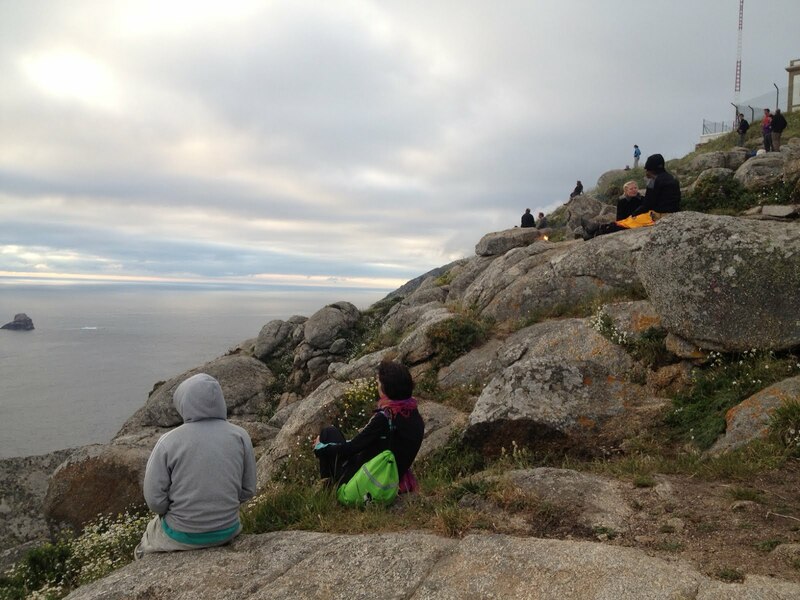 Like birds nesting on the cliff, individual and groups are forming. 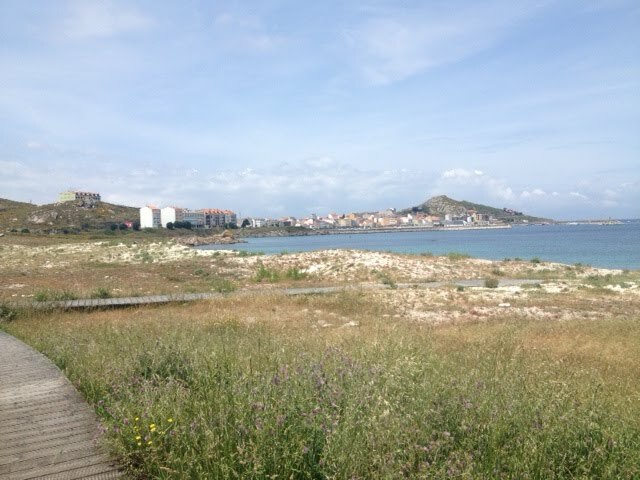 You can just about see the lighthouse at the end of the 3 plus km walk. Fisterra actually means the end of terra, or land's end. This is the end of the world before Columbus's discovery of the new world. There is also a story that a Galican has told me in the past. When God made the earth he rested his right hand on Galicia (he is left handed?). 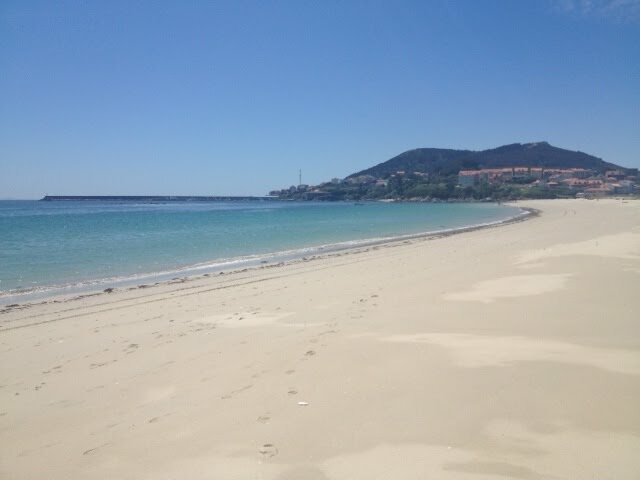 That is why Galicia has five prominent peninsula from A Coruña to Vigo. Fisterra is probably his third finger. 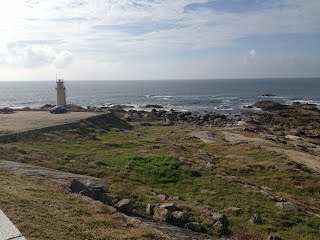 A long 3 km walk to the lighthouse. 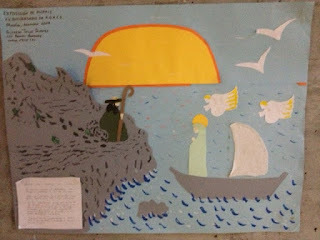 Then like birds on the cliff, pilgrim will find their own little spot to watch the sunset. The sunset is getting later as we push into summer and around this time it is just after 10 pm. 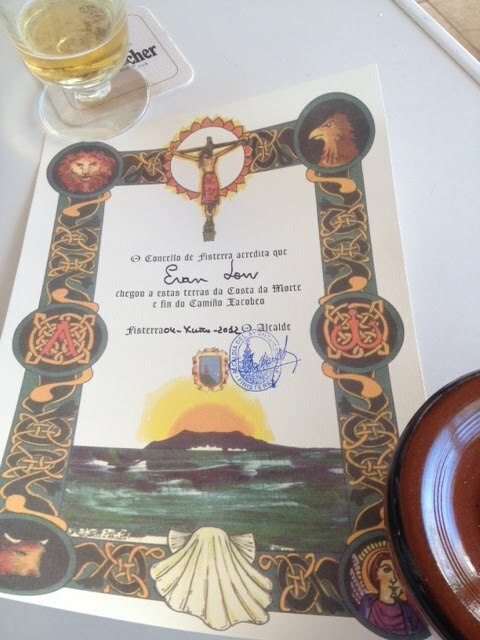 He was with me since after Santiago. Cooks his every meal, even knows how to make his own Spanish arroz con leche (rice with milk). Quietly reads his electronic tablet in the evening. Guess he is quite happy he has found other Koreans today in Fisterra. Lines of backpacks already forming before 2 pm. I am not staying there. I am just here to get my Fisterra. Staying instead at hotel ancora, same place I stayed four years ago when I slept here for 2 nights (albergue only allows one night). For the last night, I don't need people waking me up at 5:30 in the morning. Also a last morning shower before heading back to Santiago by bus. My walking is over. Only walking left for me is the 3 km to the lighthouse this evening and back (without backpack) for the last sunset on the coast. Stupid directions still wants me to walk along the hills. The moment I saw the coast it's straight on. A nice lady even offered to take my picture. And I've even picked up a concha (scallop shell) like the pilgrims in the past at Fisterra. 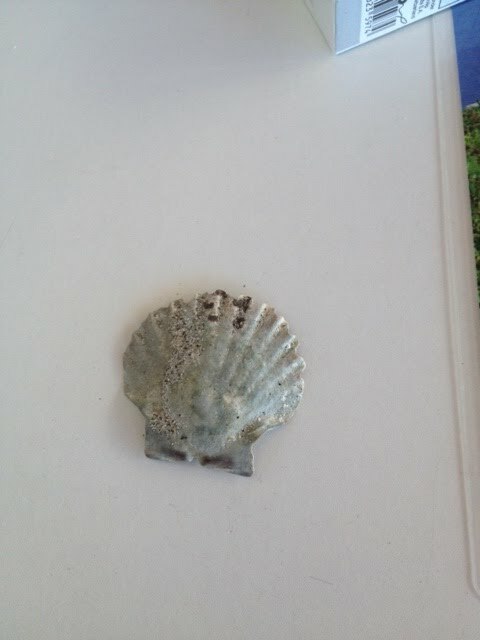 They are not easy to find even though this one is a little old looking. A look back at Muxia in the horizon. Pascal and his son Killian (taking the photo) from Ireland. 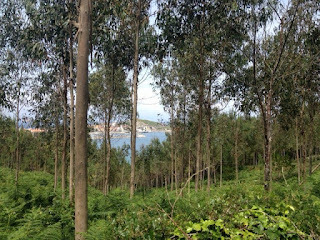 They were on bikes and we met again for the third time today in between Muxia and Fisterra (they were their way up and me on the way down). It's not easier to bump into bikers, least 3 times in 2 days so we took the picture in memory. This bar the only one in between Fisterra and Muxia is also the one that we need a stamp on our credential to prove that we walk/bike instead of taking a bus in between. Also for the first coffee and a sandwich. Day 36 - Morning in Muxia. Even caught the light at the lighthouse in the horizon at just the right timing. Forgot that I am in the albergue with a 10 pm curfew. Should have stayed in a hostal so I can watch the sunset from the coast. In any case this is the sunset view from the roof in the albergue. 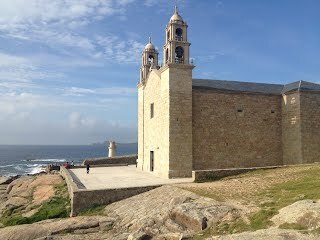 The church is Santuario de Nuestra Sra de la Barca. 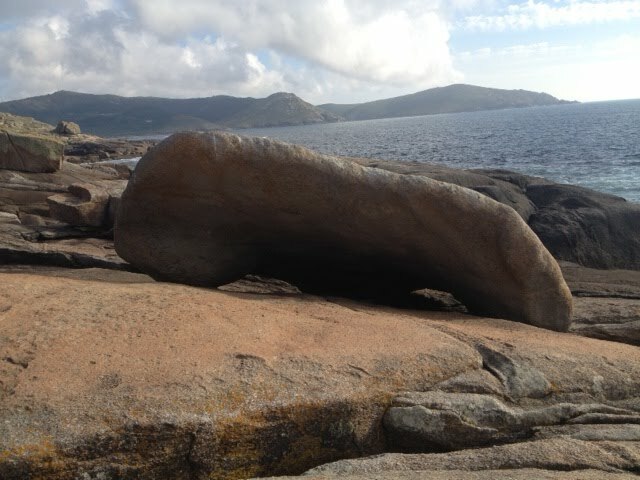 This is suppose to be the stone boat the virgin Mary was on coming to Spain to encourage St. James (he'd probably didn't do too well in his ministry while he was here). There is another site in Zaragosa on this event 600 km away. Go figure. In the albergue there are also children's paintings on the Camino, and this one depict this. What is behind the hill. Something magical about this place that I always come here every time I am in this coast. Lovely fried peppers and salted. Perfect for after walking with beer. Padron is actually a day's walk from Santiago and is allegedly the place St. James' body was brought ashore in Galicia. 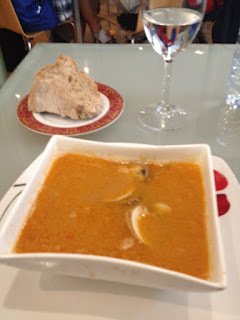 Of course you can get this anywhere in Spain, not just Galicia, thanks to Caroline for introducing it to me. Came in on the right side of town. 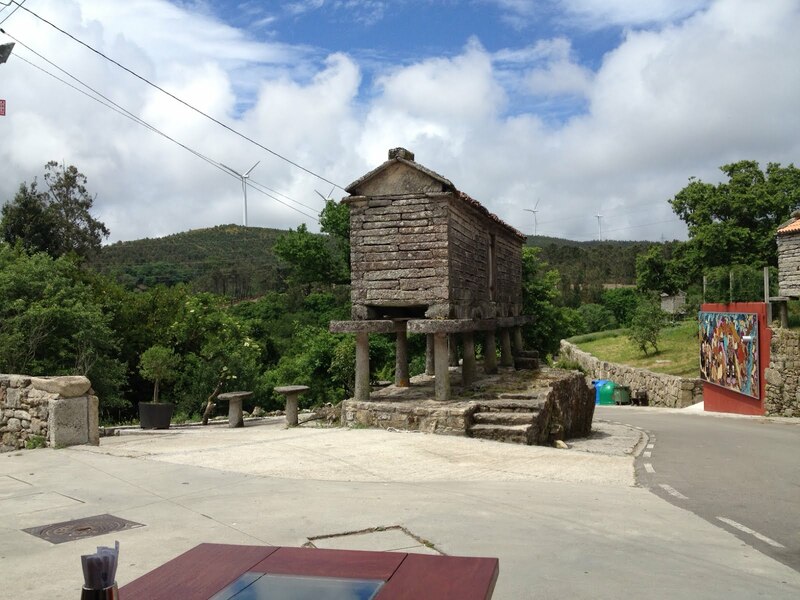 What's really special about Muxia is behind the hill. 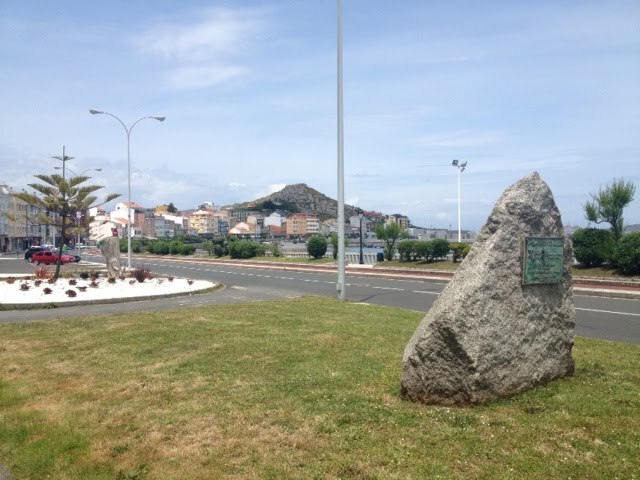 First things first, after over 30 km today, time to look for the albergue. When I finally came out to the sea, realized that it was actually north of Muxia. Means one more headland to go, already trained walking the north coast. 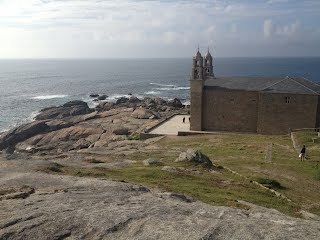 Around this area is what they called Costa da Morte (Coast of death). 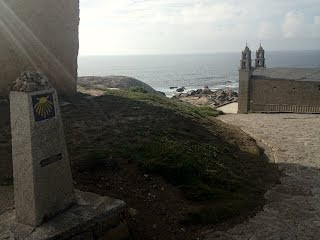 The sea here is no longer the Cantabria (Bay of Biscay) but the Altantic. Decision point. 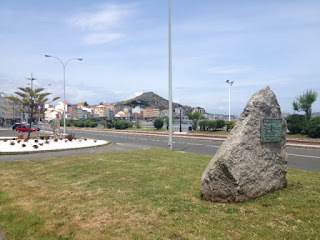 Left to Fisterra, right to Muxia. I will take right this time. 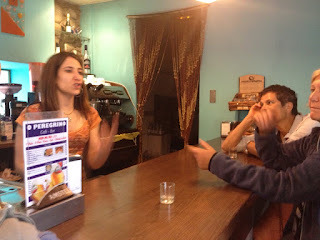 Patricia runs the bar right next to the albergue. Had a sandwich for dinner there. 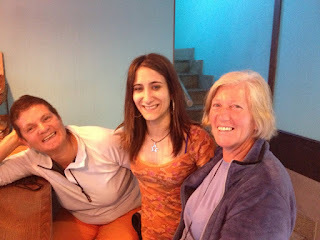 She is such a bubbly girl and we had a wonderful time with the Italians and me, even though I understood probably only ten percent of the conversation. She even gave us gratis a coffee liqueur of urujo. Very different from the restaurant hostal down the road that kept saying that there is no menu, only the menu of the day, despite the fact that my local seems to be have different food than the menu. Fun time with Jack for UK and Alison and Christine from Dublin Ireland. 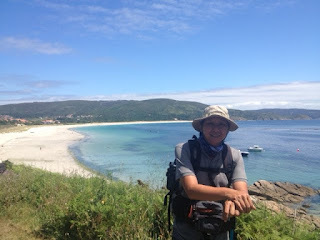 Jack just finished his Camino Fraces while Alison and Christine started from Santiago, all going to Finisterre (Fisterra) first I think. The few days that I manage to be able to have a proper lunch. 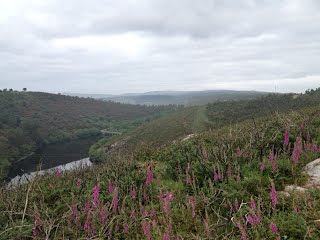 And a nice view of the hill that I would have to cross tomorrow. 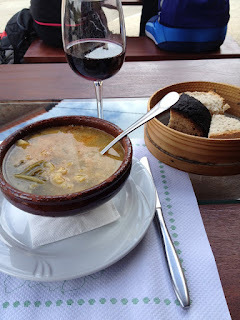 I will have to decide by then whether to go to Fisterra or Muxia. Most probably Muxia first then down to Fisterra.